My mother-in-law once marvelled at what great eaters my three children are. She just couldn’t believe that my toddler was excited about eating chickpeas and Brussels sprouts. The thing is, he never knew any other way of eating because instead of feeding him store-bought baby food, which is perfectly good and often the best option for babies, we always ground up whatever we were eating into DIY baby food to make sure his palette would eventually love the flavour of vegetables that make a regular appearance on our dinner plates. Now that my third baby is ready to move beyond breast milk and rice cereal, my husband and I have been mixing up some fun flavour combos to help our daughter learn how to develop a taste for healthy eating. 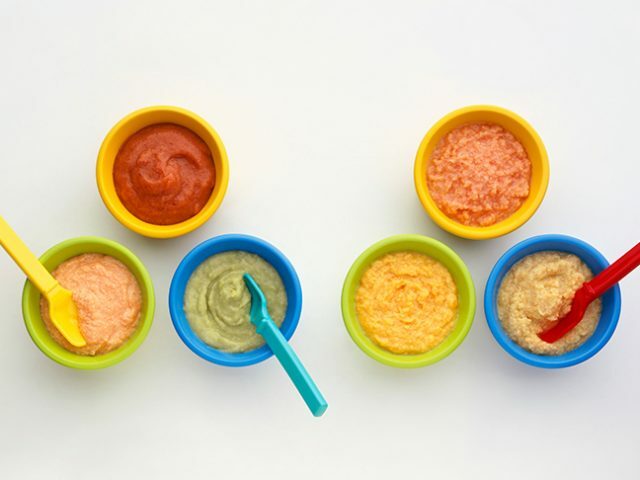 All of these recipes for DIY baby food can be made in large batches then stored in the fridge for up to a week. Also, try freezing small batches of baby food in ice cube trays and then sealing in a freezer bag. For each meal, you can pop out however many cubes you think you will need. Then, simply heat in a microwave and let cool to a preferred temperature. Using a food processor, blend all ingredients in until smooth. For older babies who crave more texture, add the oats after you blend the fruit and yoghurt. Creating high quality, wholesome foods for your baby doesn’t have to be expensive, time-consuming, or tricky. Try these fun combinations and don’t be afraid to experiment in your kitchen. Babies are surprisingly tolerant of new flavours, which is great news for parents who want to raise kids who love to eat their veggies.